Best Buy: Stores will open at 5 p.m. Thanksgiving. Most stores will close at 1 a.m. and reopen 8 a.m. Black Friday. Costco: Costco's Black Friday savings are for more than just members this year. Deals begin now through Nov. 26. Stored will be closed onThanksgiving, but sales will continue on Black Friday when from 9 a.m. to 8:30 p.m. It's possible to get some of the deals without a membership, but non-members are charged a 5% surcharge over posted prices for members. DoorDash: The online restaurant delivery service is giving away 15,000 orders of free fries for what it has dubbed Black FRYday. Use the code BLACKFRYDAY on an order $5 or more from Wendy's, Wingstop, Jack in the Box, Applebee's, Burger King, Chick-fil-A, Buffalo Wild Wings and Five Guys. While supplies last. J.C.Penney: Stores will open 2 p.m. Thanksgiving and until10 p.m. Black Friday. The first customers Thanksgiving will get coupons ranging from $10 off $10 to $500 off a $500 or more purchase, while supplies last. Ssores will re-open 8 a.m. Nov. 24, for the “Black Friday Extended” sale. 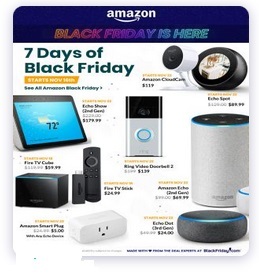 Jet: Black Friday deals will go live on Wednesday, Nov. 21 at 10:00PM, unless specified otherwise. Kohls: Stores will open 5 p.m. Thanksgiving Day. It will begin online at 12:01 a.m. CT Nov. 19. Save an extra 20 percent Thursday during the pre-sale with the code GOSAVE20. Shoppers will earn $15 Kohl's Cash for every $50 they spend instead of the usual $10 Kohl's Cash. Macy's: The in-store sale starts 5 p.m. Thanksgiving and continues through 2 a.m. Friday. Stores will reopen at 6 a.m. until 10 p.m. But the doorbuster pricing is only through 1 p.m. On Saturday, doorbusters will be available from 8 a.m. to 1 p.m.
Old Navy: Get 50% off the entire store starting Wednesday, Nov. 21 until Black Friday. 96-hour Cyber Sale starts on Nov. 24 and for two days OldNavy.com will offer 40% off everything and 50% off all outerwear, sweaters, and jeans. Roku: The Roku Ultra will be $49.99 (Save $50) at major retailers nationally beginning Nov. 22. At Walmart, Roku will release a new limited-edition Roku SE streaming player in stores on Black Friday for just $20. Sam's Club: The members-only sale starts online at 12:01 a.m. n Thanksgiving and in-store at 7 a.m. Black Friday and continues through Nov. 25. Sephora: Shop products $15 and under starting Nov. 15 in the Sephora app. Get 50% off select products each day the week before Black Friday. Stage Stores: The first 75 people 6 a.m. Friday get a free holiday tote bag and a $5 coupon at Bealls, Goody's, Palais Royal, Peebles and Stage stores. Target: Black Friday deals will start online early Thanksgiving morning and stores will open at 5 p.m. Thanksgiving and stay open until 1 a.m. Black Friday. Stores will reopen at 7 a.m. on Black Friday. TooJay's: Kids 12 years old and younger eat free with purchase of an adult entrée Friday through Sunday when they show a coupon available at www.toojays.com. One free kid's meal with one paid adult entrée. Ulta Beauty: Ulta's sale begins at 6 p.m. ET online and in-stores at 6 p.m. local time on Thanksgiving Day. There will be exclusive offers called "beauty busters" and small gifts under $10 and $15, which are great stocking stuffers. Walmart: In-store Black Friday sale starts at 6 p.m. Thanksgiving at most stores. There are pre-Black Friday deals available on Thursday, Nov. 8 and select deals will be available online starting at 10 p.m. Nov. 21 on TVs, laptops, and more.